The Glorious 12th of August marks the start of the grouse shooting season which runs until December. I like the little birds and you’ll often find them on upmarket menus during the autumn months. 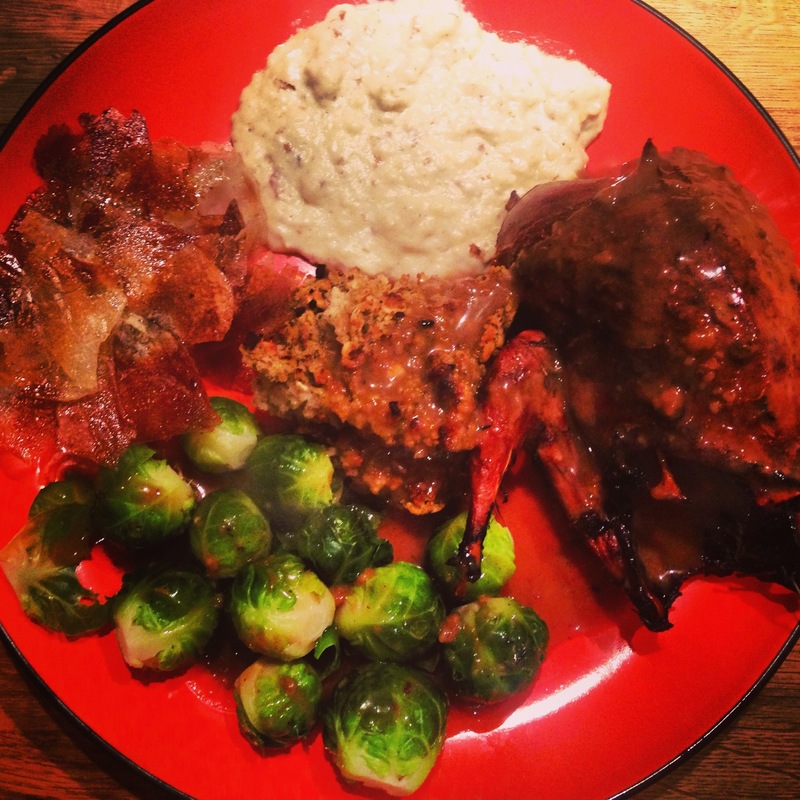 However what I really like is the trimmings, creamy bread sauce, crispy potato chips and fresh green brussel sprouts, all a nod that the best meal of the year (Christmas lunch) is not far away. 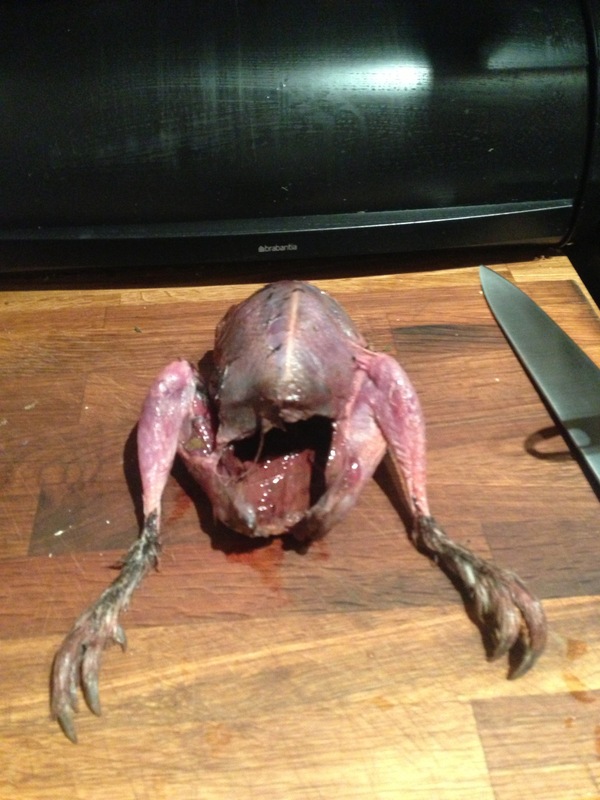 I’ve read that at the start of the grouse season some unscrupulous suppliers have been known to push out any remaining birds they had in their freezers. For that reason now seems the perfect time to buy fresh as the season is in full swing and the shooters are supplying a steady stream of the feathered foodstuffs. Down at Borough Market virtually every butcher seems to have grouse squeezed alongside pheasant and maybe a partridge or two. I got mine from my favourite poultry supplier Wyndham House at £9 each but I noticed the Ginger Pig was doing two for £14 – perhaps an indication of the number of birds on the market. When I got home I roasted mine rubbed with butter, seasoned and draped in streaky bacon for about 20/25 mins in a very very hot oven. Best served pink but you can cook them more thoroughly. Admittedly small game birds can be tricky to eat but a sharp knife and a generous dollop of creamy bread sauce makes the experience one of the great culinary luxuries. 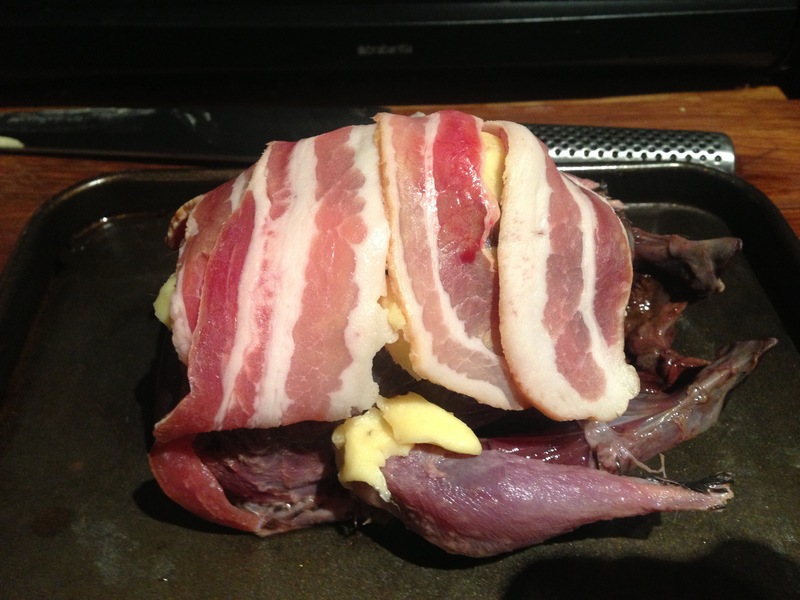 Prepare the birds by smearing a little fat over the breasts, seasoning with a twist of pepper and covering them with a couple of rashers of streaky bacon. 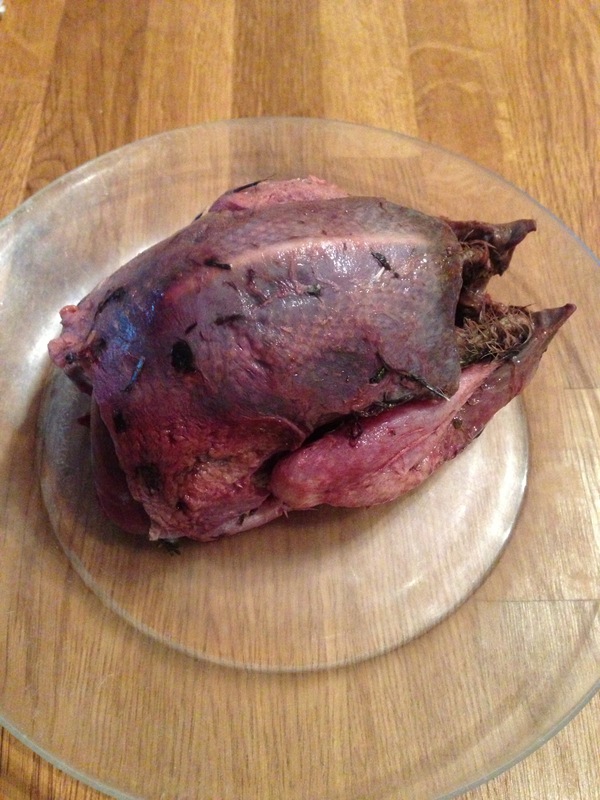 The grouse’s liver is particularly good, and can be replaced in the cavity, perhaps with a couple of teaspoons of port, before cooking. Place in a roasting tin and put in the centre of a very hot oven (230C/gas 8). Remove the bacon after 8-10 minutes and take it out of the oven if it’s as crisp as you’d like it to be. At this point you could baste the birds with any fat in the tin, but do it fast so as not to let the oven cool. About 20 minutes in total should be enough to cook most grouse through without drying them out, 25 minutes for a larger bird, provided in both cases they can rest for 10-15 minutes while you prepare the gravy. The meat should be just a little pink, but if this is not to your taste, add 5-7 minutes to the cooking time. Skim off any excess fat from the roasting tin (what little there is will be from the bacon). Place the tin on the hob and sprinkle just a teaspoon of flour into it. Scrape the base with a wooden spatula, scratching up any crispy bits and mixing them with the flour and juices. Use a small splash of wine and a little of the reserved stock to help this process and loosen the gravy. Now strain all the liquid in the roasting tin through a sieve into a small clean saucepan. Whisk in the rest of the stock and bring to the boil. Taste the gravy, adding just a little redcurrant or quince jelly if you think it needs sweetness. Boil to reduce if you want to intensify the flavour, then season with salt and pepper as you see fit. Whisk in a little more flour if you want to thicken it. In short, fix the gravy how you like it. 1. To make enough for eight people, halve a large onion and stick cloves into each half (how many you use is a matter of personal taste – I suggest 15-18. If you don’t like them at all, use some freshly grated nutmeg instead). Place the onion halves in a saucepan with a bay leaf, 8 black peppercorns, 1 pint (570 ml) of creamy milk and some salt. Bring everything up to simmering point, remove from the heat, put the lid on and leave everything to infuse for at least 2 hours. 2. When you are ready to make the bread sauce, remove the onion, bay leaf and, if you can, the peppercorns, with a draining spoon. Keep the onion to one side, as you may want to put it back into the finished sauce for extra flavour. 3. Stir 4 oz (110 g) freshly made white breadcrumbs into the milk and add 1 oz (25 g) butter. Stir over a low heat to melt the butter and thicken the sauce slightly – this will take about 15 minutes. 4. After that, you can add the onion back in, to give the sauce extra flavour. Leave the sauce in the pan in a warm place until you are ready to serve it. Just before serving, remove the onion and spices. Re-heat the sauce gently then beat in another 1 oz (25 g) of butter and 2 tablespoons of double cream. Taste to check the seasoning. Pour into a warmed serving jug. 3) Roast in 200c oven for about 10 minutes until crisp. 4) Drain on kitchen paper and repeat until you have enough, season and serve.